Hello everybody! 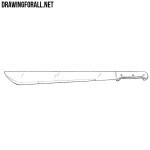 In this drawing lesson we will show you how to draw a scimitar. Scimitar – a sword with a curved blade, in which one side is sharpened completely, and the other side is sharpened only near the tip. First we draw the most important part of the melee weapon – its blade. The main feature of the scimitar is a curved blade of interesting shape. Now draw the sharpening lines of the scimitar. As we said – it is the lower part of the blade and a short area near the tip at the top side of the blade. Now draw the guard. The guard of the scimitars as you can see also is very unusual. It is curved from both sides. 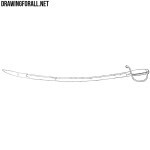 Draw the grip of the scimitar. 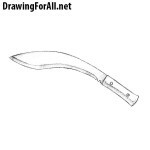 Draw the grip of the scimitar. Grips of such weapons are pretty short because it is one handed swords. 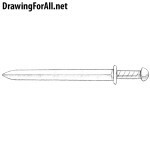 Now draw the pommel, which serves to improve the grip of the sword. Pommels of scimitars are usually curved down as in our example. And on the last step we add shadows. 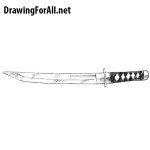 Just use simple hatching to draw the shadows and using some short strokes add glare to the blade. It was a lesson on how to draw a scimitar. A sword that called “exotic” in a lot of computer RPGs and usually used by skeletons. 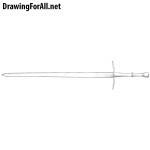 If you liked this tutorial you will probably like the lesson on how to draw a short sword. Don’t forget to share our tutorials and subscribe to us in social networks.